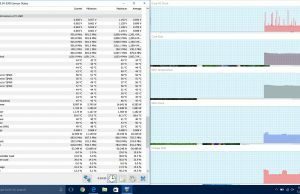 Summary: I like the Aorus x5. It has it where it counts: nice build quality, good screen, good keyboard, lots of connectivity and upgrade options, etc. The trackpad is decent too, albeit very ugly. My main concerns with are the ugly logos and questionable Wifi reception. but as a whole, if someone were to ask if the Aorus x5 v7 (1070 version) is a good buy, I would have to say yes. I do not recommend the x5 MD model with Max-Q 1080, though. This is a perfect example of where not to use Max-Q and Aorus should not be rewarded more money for doing so. The fact is, you’re paying more for less performance and is just not worth it. 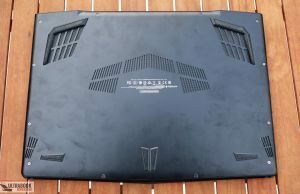 After an extremely long delay, it looks like Aorus has finally released their v7 line of laptops. These are the same laptops introduced back in January at CES, which are similar to the v6 line, but with Kaby Lake processors. With Volta coming so soon though, you have to wonder if they are too late to the party to even be relevant. I did spend a short time with the Aorus x7 DT v6 and I really liked what I saw, so I was very interested to see that they crammed a 1080 into the Aorus x5 MD. But the MD stands for Max-Q design and that has been a concerning issue with many people out there wondering how worth it Max-Q really is. Given my recent whirl with the Asus Zephryus, I decided to give the x5 MD a shot. I’ll get right to the point – I’m not pleased with the x5 MD at all. It’s a complete waste of money, and that’s a fact – not just my opinion. The x5 v7, which is the GTX 1070 version, actually outperforms this machine and is significantly cheaper in price. 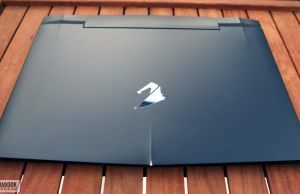 The good news is the x5 v7 in general is a pretty decent machine though and this review applies to that model in every way, except for the GPU and maybe another screen option. So if you’re interested in learning more, please read on and see my findings. But keep in mind that while I’m not overall happy with the x5 MD that I have in hand, I do like many aspects of the x5 v7 and think it’s a pretty good option to buy. 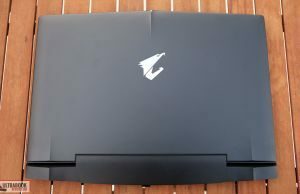 If you’re familiar with the Aorus x5 design from last year, this model looks mostly the same, but there are some subtle differences that were made, both good and bad. Overall though, it’s a pretty good design and I’m OK with it in general. The build quality feels decent for the most part, but there’s definitely room for some improvement. There’s a tremendous combination of both metal and plastic throughout the laptop. They blend together pretty well, but there is a little bit of creakiness with some of the junctions, particularly with the lid and the rear vents. 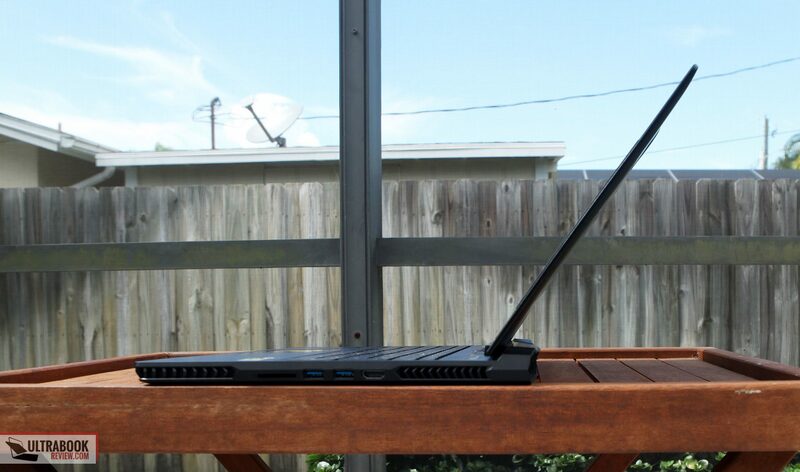 The laptop is pretty well balanced and feels easy to carry around. Aorus’s spec is 5.5 lbs, but I measured 5.8 lbs on my unit. The overall width of the laptop is reported to be .9”, which is true for the most part. I measured .9” on the front, .95” on the sides and 1.05” on the back edge. I’m not too concerned with the added width on the back edge because it’s probably the last place you’ll want to be carrying the laptop by. The vent is made of plastic, so it’s a little harder to grip on to, for starters. On top of all that, the edges are pretty sharp in some areas, especially the corners. Picking up and carrying the laptop on all the other ends is the ideal path. From the top, the lid is made of a magnesium/aluminum alloy with a matte finish. In general, everything on the laptop is black in color. One exception is the silver Aorus logo that is centered on this lid. This logo is backlit and glows proportional to the screen brightness. It’s one of the ugliest features of the design, but it’s flush with the metal and can easily be covered up with a decal if you don’t like it. The rest of the lid is pretty plain but there is a small ridge at the tip with a white dot for added effect. 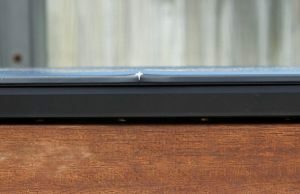 The hinge area is a little less traditional from other laptops, as it’s not very close to the back edge. It’s mostly because of the large vents but at least it doesn’t adversely affect how far the lid opens. The hinge is a pretty good design, requiring only one finger to lift the lid – one of my pet peeves. 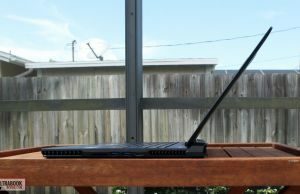 The screen is pretty sturdy at any angle you leave it, with the lid being stable, even while moving the laptop around. The bezels on the screen are pretty average. What’s interesting is, unlike most other laptops, the bezel appears to be made out of metal instead of plastic. 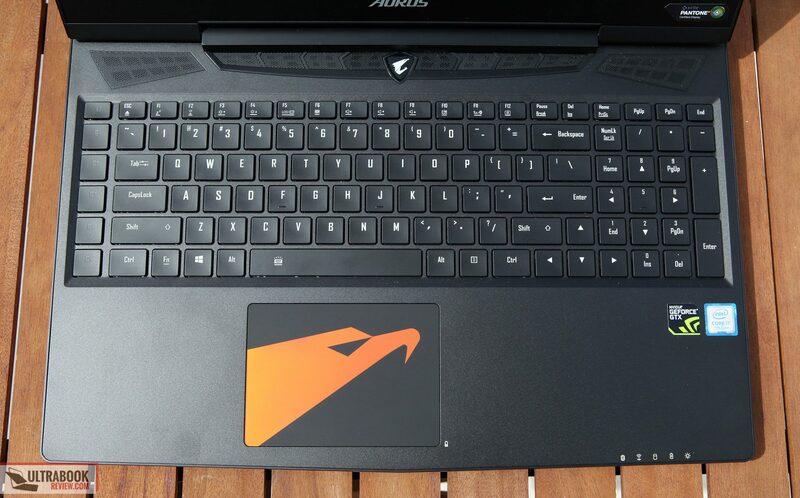 The Aorus logo is centered on the bottom underneath the screen. Up top is an HD webcam, the microphone array and an ambient light sensor. There’s a pantone certification sticker on the lower right, which can easily be peeled off. Down below at the palm rest is your keyboard and trackpad. More on those later, but note that this is a full keyboard layout with the num pad. 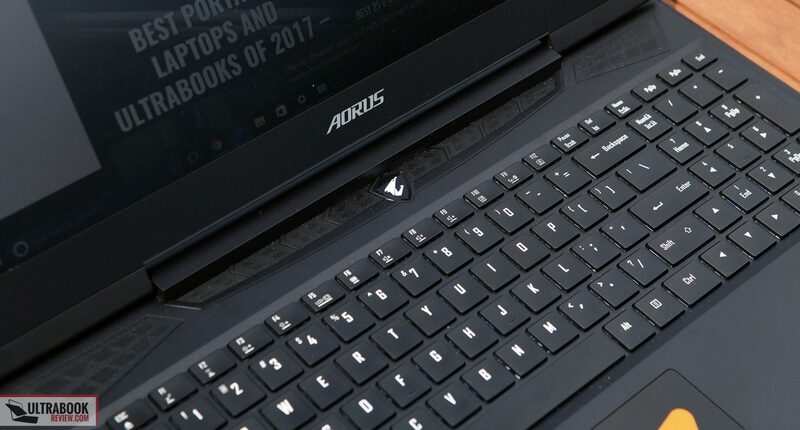 Centered above the keyboard is a power button, with the Aorus logo on it which unfortunately glows bright white and there’s no way to shut it off. 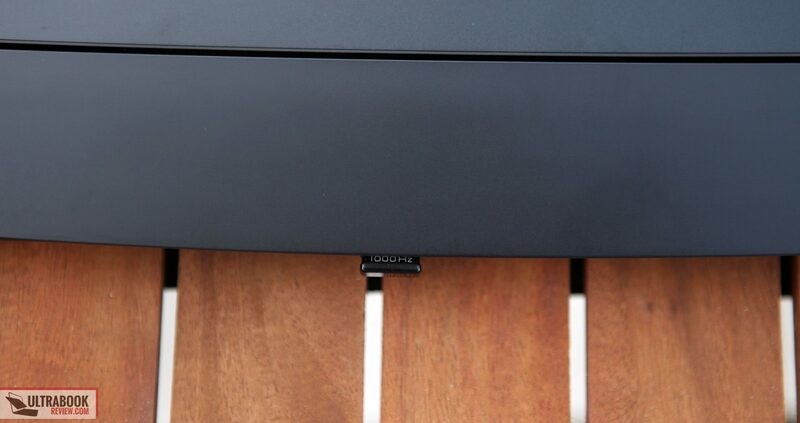 On both sides of the power button are speaker grilles and some passive vents. One thing to note on the palm rest area is that it’s not a unibody construction. The palm rest is metallic, and it’s a single piece with the keyboard, which is an improvement from the v6 model. But all around the sides is a seam, connecting to the plastic edging. The seam is flush and there are no gaps, but I do wonder how well that will hold up over time. 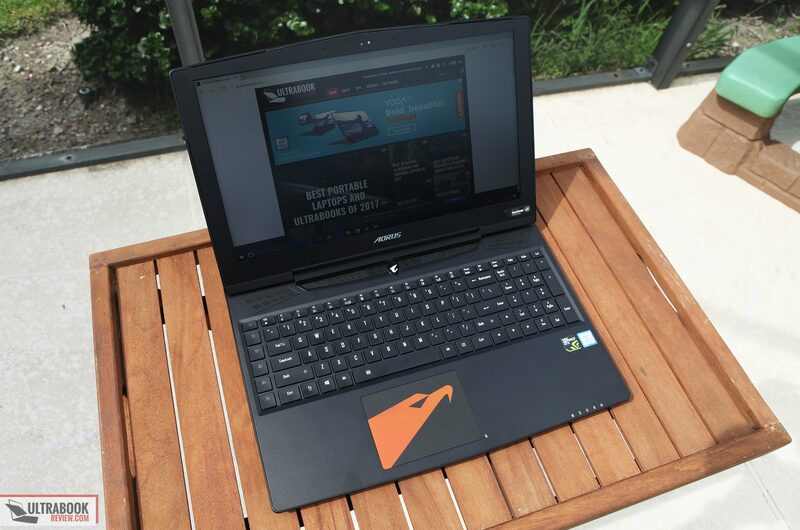 Aorus goes all out with the connectivity options on this model. Starting on the left side is a Kensington lock. 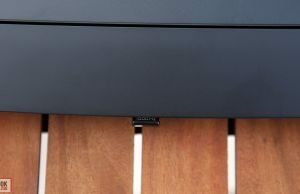 There’s a mini-display port connection with a Thunderbolt 3 enabled USB-C right next to it, both of which can be connected to an external display. 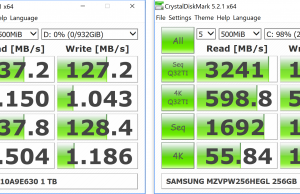 There’s an extra USB-C connection but it’s only USB 3.1 and not Thunderbolt. Next to that is a headphone and microphone jack. Note that the headphone jack has a 32-bit Sabre Hifi audio DAC, for an excellent listening experience with higher quality headphones. 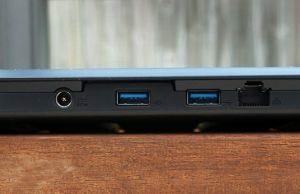 On the right side are a pair of USB-A 3.0 ports. There’s also an HDMI 2.0 port. Finally, there’s a SD card reader. This is a full SD card reader, so when a card is inserted, it does not stick out very much at all. Another special aspect about the reader is it’s connected to a PCI lane and not USB – so expect very high transfer speeds for your high speed memory cards. The back also has some connectivity. There’s another pair of USB-A 3.0 ports. 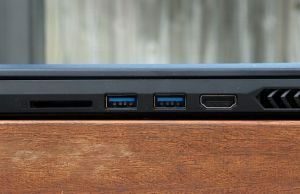 One of these ports is under a lip, which would be an ideal place to sneak a wireless mouse dongle. Mine only sticks out a little bit, after inserting it. Also on the back is an ethernet connection as well as the DC power input. There’s no connectivity on the front, but you can see some of the vents on the corners. Speaking of vents, this is something that’s not lacking at all on this model. Those two vents on the corners are passive vents, but the other two vents on the sides are active intakes for the fans. There are also some intake vents coming from the bottom of the laptop. Finally, there are two very large exhaust vents coming from the back of the laptop. 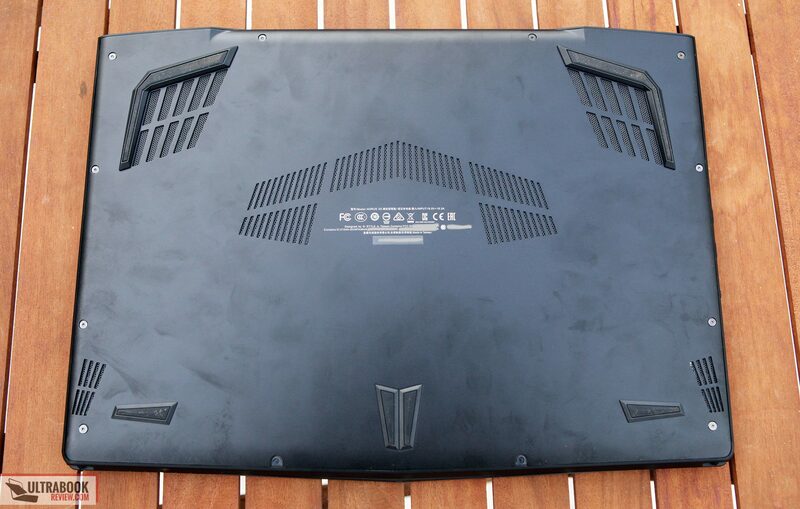 Besides the vents, there’s nothing else to say about the bottom of the laptop. All the regulatory information and the serial number is embossed onto the metallic lid. It’s small and discreet, which I appreciate. All around the bottom are some pretty robust rubber feet. There are also a number of torx screws that hold the bottom lid on. A couple of screws at the bottom have black stickers on them, but from my understanding they don’t affect your warranty if you remove them(at least in the US). I’m ok with the overall design. It feels high quality but I expected a little more, to be honest. At this price, I pretty much expect a unibody construction, with a little less plastic. At least the plastic is tastefully done and feels like it’ll hold up for a long time. The only other gripe I suppose I could have is the sharp edges on the back vents, but considering it’s not ideal to handle the laptop from that end, it shouldn’t be a big problem. The keyboard on this model is pretty decent. Like I meantioned before, it’s a full layout keyboard, with a numpad. The keys are chiclet style and are properly spaced apart, as far as I can tell. A welcome change from last year’s model is the fact the keyboard is built into the palm rest and not a separate component. What that means is there’s little or no keyboard flex. I took my typical typing test and scored 50 wpm, which is pretty much my average. For the most part I type well on this unit, but I do find that I have to type a little harder than on others. I measured the actuation force to register a keystroke and I got a strong 70g before it depressed. The feedback force was measured to be 40g, which is pretty good. The average key travel is 1.6mm. The keyboard is backlit and has three levels of brightness, if you strictly use the keyboard shortcut to control it. If you use the Aorus software though, you can set the brightness with the software slider. More importantly, you can change the colors of each individual key, similar to how it’s done on the Razer Blade. The software for changing the lighting of the keys is not as polished as Razer’s, but it gets the job done. I do prefer Razer’s options because there are more effects, as well as the ability to change profiles with a keyboard shortcut. To change profiles on this model, you have to open the software and do it manually. 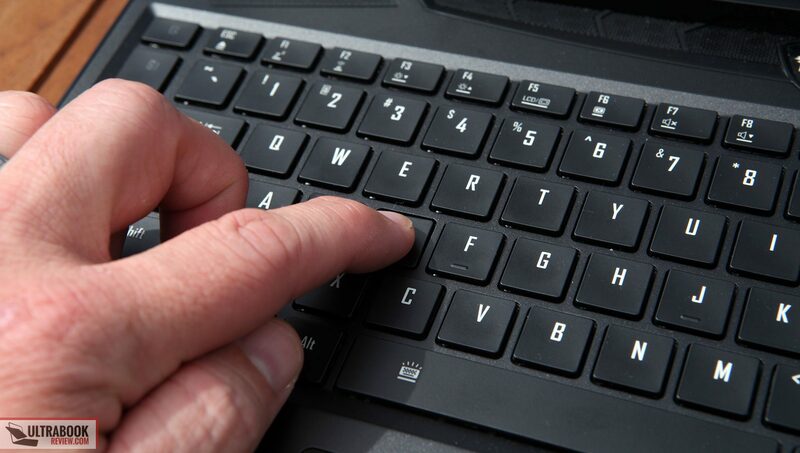 Another small gripe I have is the font Gigabyte decided to use on the keys. It’s not childish, alien or robotic or anything, but it doesn’t look normal by any means. At least the secondary functions on the keys are backlit, so there’s a 1-up on the Razer keyboards. And now onto the trackpad. I take it back when I said the backlit logo was the ugliest part of the laptop… This trackpad gets that honor and is probably the ugliest trackpad I’ve ever seen. For some reason Gigabyte decided to put a bright orange eagle head on the trackpad. Last year it was blue, which I think I would have preferred to this. The fact is, the lighter the room you are in, the more this thing sticks out like a sore thumb. 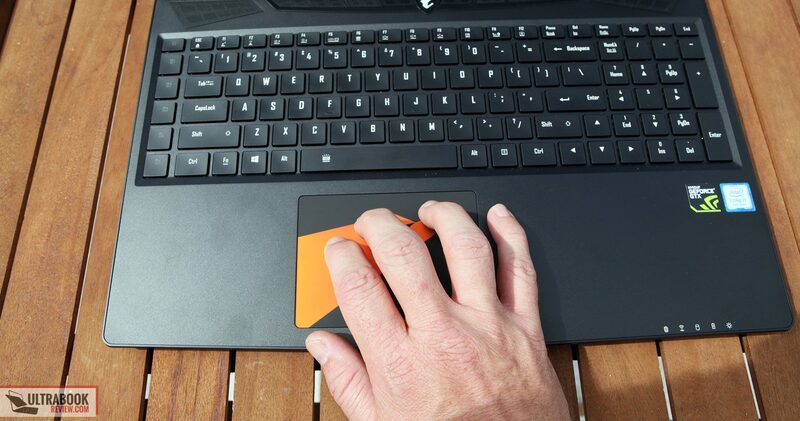 Enough about how the trackpad looks though – its performance is what counts. It’s not perfect though, especially at first. In fact, I found the trackpad to be pretty stressful to use at first, mainly because of how tacky the surface felt. Upon further investigation, it looks like the trackpad surface is made of a silicone like material, instead of plastic or glass like I’m used to dealing with. After a few days, I think the oils on my fingers must have rubbed off or something, because it’s a little easier to use now. The only time it becomes an issue is in humid environments where there might be moisture on my hands. Other than that, I’m pretty much used to the surface. I would have preferred the same glass trackpad I’ve seen on the v6 models last year. The good news is the trackpad tracks pretty well and I was able to initiate multi-touch gestures with ease. The sensitivity was a little off at first and I struggled to make small movements. It was easy enough to adjust to my liking though. The trackpad is Elan brand, so you’ll see the same configuration options that come with all Elan model trackpads. It’s also a click pad, so there are built in left and right buttons on the corners of the trackpad. If you don’t like that, you can also configure the drivers to register left and right clicks with taps and double finger taps. There are two screen choices for the Aorus x5 model, but the MD model only has the 4k screen. It’s a matte, non-touch panel with a maximum resolution of 3840 x 2160 and a refresh rate of 60Hz. Overall, it’s a great panel and probably one of the biggest highlights of the machine. The model for the panel is BZ156ZAN02.3 with a HW Id of AUO23EB. It’s an IPS panel with superb viewing angles and contrast ratio. Using my Spyder4Pro, I measured a contrast ratio of 650:1 at the highest brightness. Speaking of brightness, the screen gets up to about 305 nits and can go as low as 15 nits of brightness. That’s pretty good for most people’s needs. The color accuracy is pretty accurate, right out of the box. It’s Pantone certified, which probably means that the colors are accurate to Pantone color standards. So if you’re doing any photo editing or illustration work, this aspect might be important to you. I did recalibrate the screen with my tool though, and while I can’t tell you exactly how accurate each color is, I can say that the calibration didn’t do a whole lot to change the colors. In other words, the screen is calibrated properly – something I almost never see. I measured the color space as well. I got 96% sRGB, 69% NTSC and 74% aRGB coverage. That’s pretty much as good as it gets for IPS screens and I’m very happy with what I see. This panel is GSYNC enabled, which is a pretty nice feature to have, especially while gaming at lower resolutions and high refresh rates. I didn’t notice any screen tearing or any sort. GSYNC also improves the performance of games, as syncing refresh rates is controlled at the hardware level instead of software with Vsync. Another nice thing about it being GSYNC is Optimus is disabled – so you’re able to add custom resolutions without having any special drivers. I was able to change my resolution to 2880 x 1620 px or even 2560 x 1440 px with no issues. I highly recommend 2880 x 1620 px as it makes everything look crisp, resolves most scaling issues and allows the laptop to game pretty well, by default. 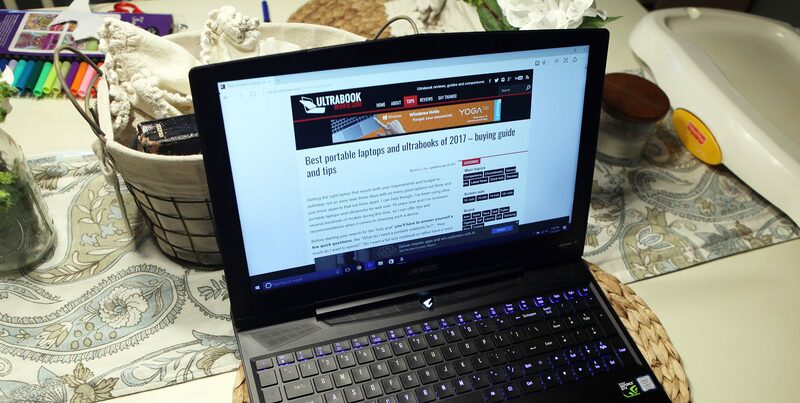 The other screen option of the Aorus x5 is actually a 2880 x 1620 px panel. From what I understand, it’s a decent IPS panel, but the color space is significantly lower. I don’t have the numbers to back it up, but I did have the glossy version of the panel in my old GS60 and I can say there’s a significant difference. Given the choice, I’d say go for the 4k screen. 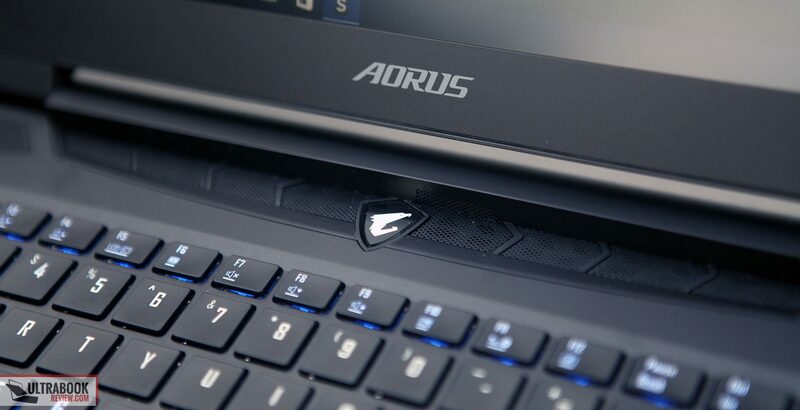 The Aorus x5 MD comes with an overclockable i7-7820HK CPU which starts at 3.9Ghz but can be overclocked to 4.3 Ghz using the Command and Control software. The MD also comes with a GTX 1080 Max-Q GPU, which is also overclockable. 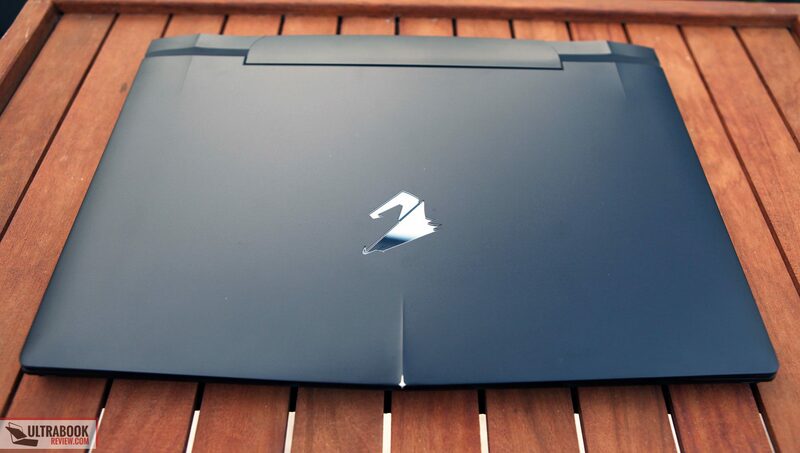 But don’t get too excited just yet – this is where my interest in the Aorus x5 MD starts to fade away. 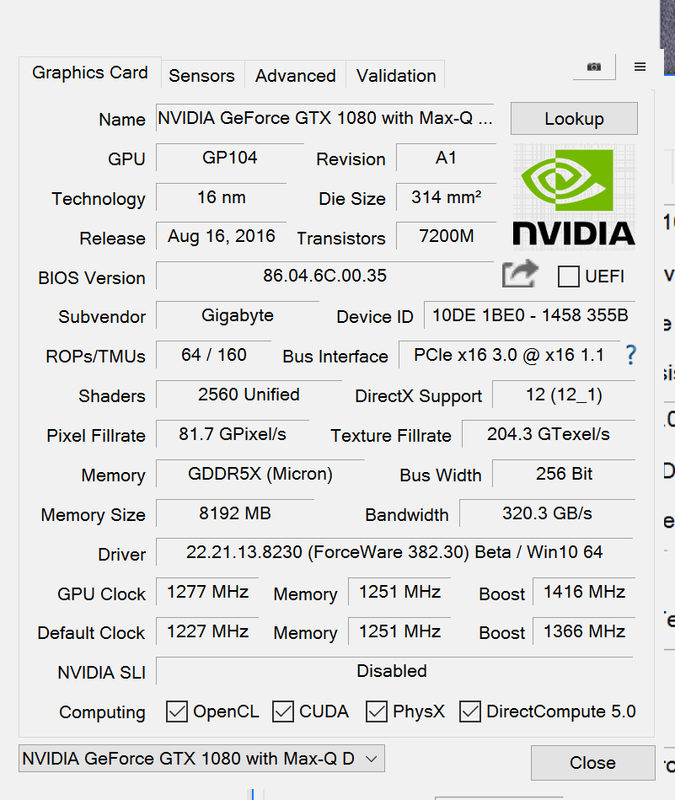 Yes, you can overclock the CPU and GPU, but as far as I can tell, it hardly does a thing (especially for the GPU). The fact is, because of the Max-Q design, there is very little overhead to overclock anything without violating the 200W power limit Aorus set. It would be nice if they allowed 230W, like on the Asus Zephyrus I just reviewed, but they didn’t. I don’t know if it was because of noise levels or what, but the performance on this laptop was not as good as I hoped. I’ll touch on this more in a bit. There is a second empty M.2 slot under the cover, if you want to add a second M.2 drive. There is also a 2.5” bay, which is occupied by a 1TB HDD. All of these upgrades, including the RAM, are pretty easy. Just remove the screws and the cover pops right off. All of the empty bays are easily accessible. 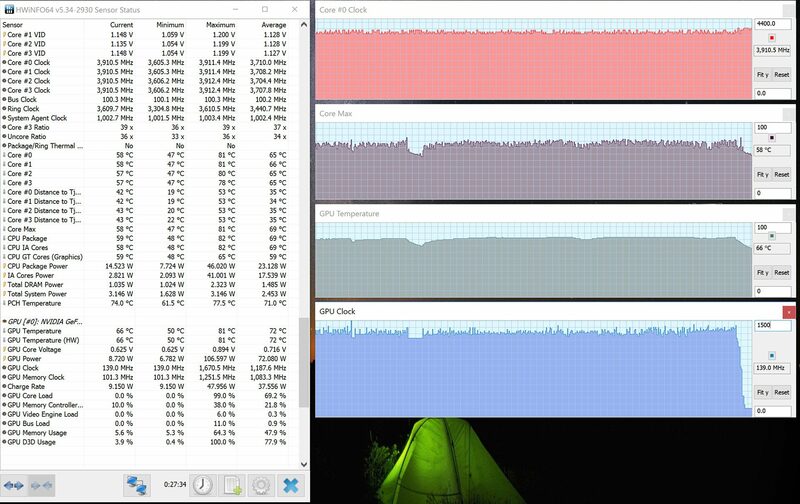 CineBench R15:OpenGL: 43 fps, CPU: 802 pts, CPU Single Core: 151 pts. While these results may seem good, there is something that needs to be pointed out. The graphics results are very similar (but slightly worse) than on a laptop with a GTX 1070. In fact, if you take the same benchmarks on the Aorus x5 v7(with a 1070) and even last year’s x5 v6, they both outperform this Max-Q GTX 1080. 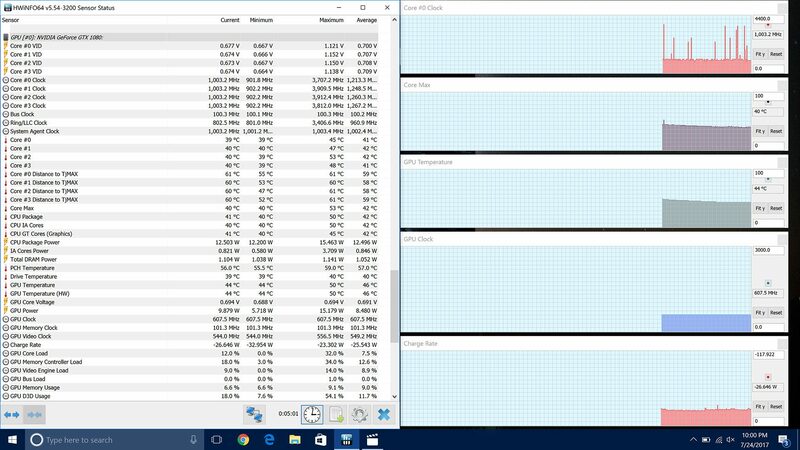 As you can also see from the benchmarks, there’s only a slight change from overclocking the CPU, but almost no improvement from overclocking the GPU. So there’s no squeaking out some extra GPU performance like I was able to accomplish with the Asus Zephyrus. As I stated before, I think this all comes down to hitting power limits. The maximum wattage I measured going to the GPU on this unit was 108W, while on the Zephyrus I got it up to 120W. The Zephyrus had a 230W adapter, while the Aorus only has a 200W, so that’s another limitation as well. Witcher 3– Walking back and forth through the opening scene and the first tutorial. Again, pretty good results, but still not what I was expecting to see – even for a Max-Q 1080. Take Witcher 3 for example. 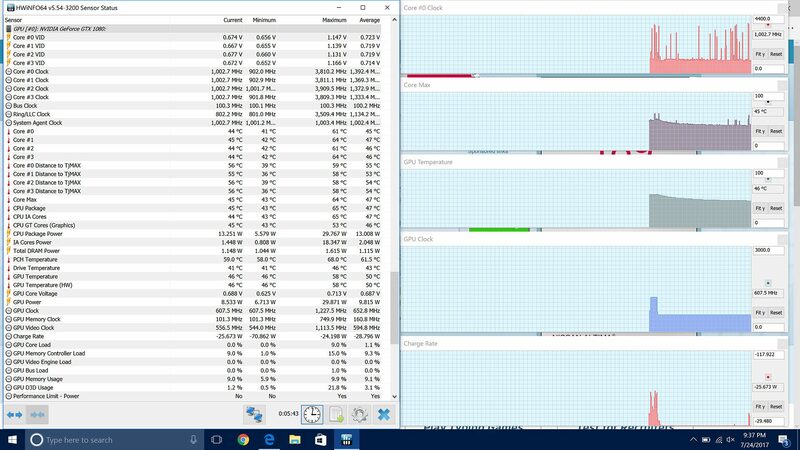 My ultra 1080p test resulted in 66-72fps. 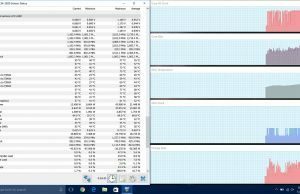 I did the exact same test on the Alienware 17r4 and got 85-92fps. An unfair comparison, yes, because the AW17 has a full 1080 in it. But I also ran the same test on the Asus Zephyrus and got 70-77fps. The Aorus is a thicker laptop with potentially better cooling, so I expected to at least match the Zephyrus. 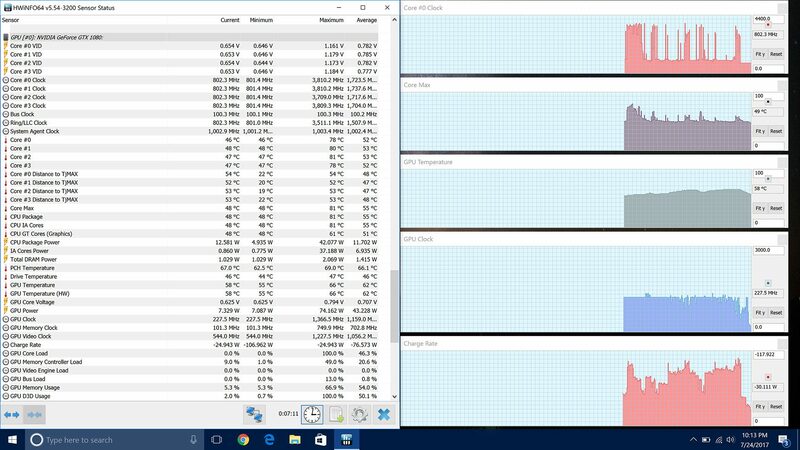 These gaming results support the lower than expected synthetic benchmarks though. There is definitely some reduced performance when compared with a full 1070 and the Max-Q 1080 in the Zephyrus. 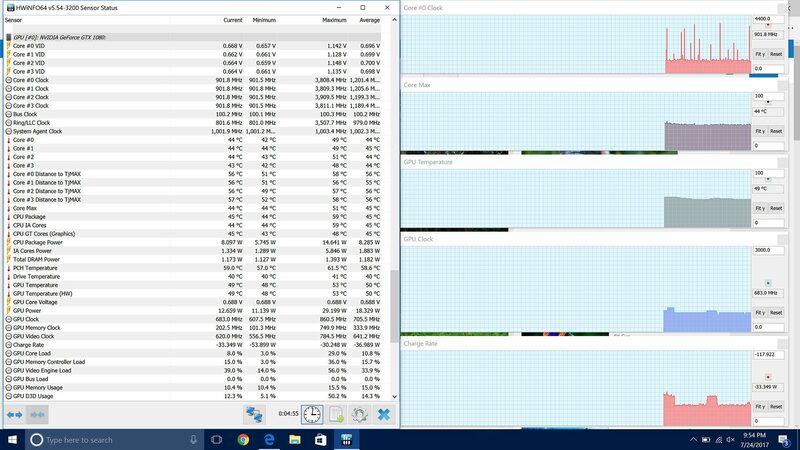 And it’s most likely due to a lack of power being supplied to the GPU. With such a high end GPU and an overclockable GPU in a <1” chassis, you would be correct to assume that heat production would be an issue. I took some thermal readings after a 30 minute Doom session and got some pretty hot spots on the underside of the laptop. So if you plan on using this on your lap while gaming, you might want to consider a cooling pad. The normal use temperatures aren’t quite as bad. There is that 35C hot spot, but it’s in a spot that won’t touch your leg and the rest of the laptop feels pretty comfortable. Of course that’s with light loads, so if you’re doing heavier work, it’ll certainly get warmer. Max-Q apparently implies that noise levels are < 40dB and this laptop falls in line with that spec. Although the noise levels are low, the overall tone of the fan noise is not appealing. Even at low levels, I can still hear a low frequency hum. 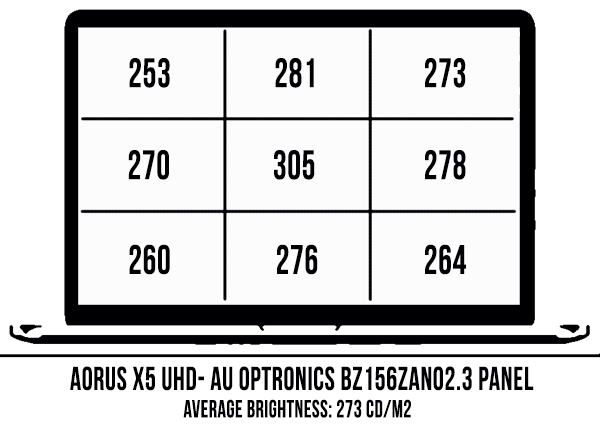 Radios – The Aorus x5 includes Killer Wireless AC 1535 – a card which I’ve had mixed results on in the past. I’ve been getting a solid connection, with no drops, for the most part. But I question the signal quality. I took some speed tests. The first test was 25ft away and I was able to max out my ISP at 90Mbps. But as I got to about 50 feet away, with two walls in between, my connection dropped to 14.4 Mbps. Going further to 100 feet, I still got 10Mbps. These results are a little lower than on the recent machines I’ve received. I can’t tell if it’s driver related, but it could likely be signal quality due to the all metal lid. Unfortunately, I didn’t have a spare Wifi card to swap out and see. Also included is Bluetooth 4.1 and Killer Gigabit Ethernet connections, both of which worked fine, with no issues. 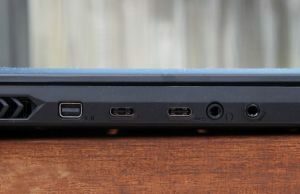 Speakers – There are 4 speakers on this laptop – two upward facing above the keyboard and two downward facing on the front sides. They are plenty loud, reaching 70dB in amplitude. The quality of the sound is also pretty decent. There is some pretty good software to adjust the EQ settings, which I highly recommend using. Out of the box the sound was very plain, but I was able to adjust the sound curves to my liking and get the sound to what I wanted. Gigabyte calls them subwoofers, but don’t be fooled into thinking you’re going to hear heavy bass on this machine. The lowers bass frequency I could detect on the speakers was 75 Hz and it was very faint at that level. They still help with the mids though, and I welcome the sound they produce. More importantly, the Aorus x5 also includes a Sabre Hifi Audio DAC. 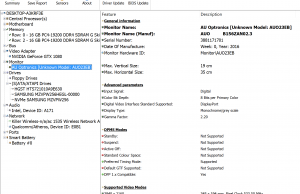 This is similar to the DAC that was on the MSI GS73VR, only a different brand. With higher quality headphones, you can listen to some very good quality sound coming form this headphone jack – it makes a big difference. Webcam – There’s not a whole lot to say about the webcam. It’s HD and takes decent shots in the light, but gets a little grainy in low light conditions. It gets the job done, but is nothing compared to the higher quality webcams out there. Doens’t include Windows Hello features either. The configuration I received has a 94 Whr battery, which is 5 Whrs from the maximum allowable battery size on a laptop. It’s a good thing too, because with GSYNC and this 4k screen, you’ll need all the battery power you can get. 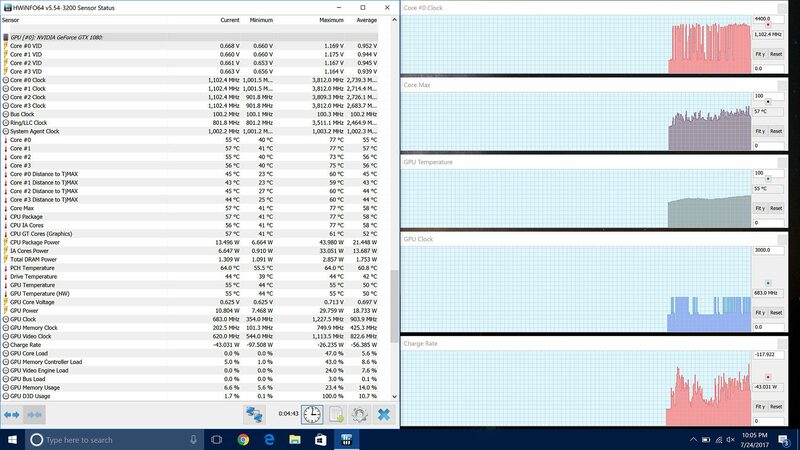 I ran my typical battery test which consists of using the stock “Power Saver” power profile, 20% brightness (90 nits), WiFi off, Bluetooth off, and running a 720p movie in a continuous loop at full screen with the volume muted. I start the clock when it’s unplugged and stop it when the unit performs a self- shutdown. The Aorus x5 MD lasted a mere 3 hours and 10 minutes before shutting down. Not long at all, but again, it’s about what I expected considering there’s no iGPU in use and there’s a bright 4k screen. 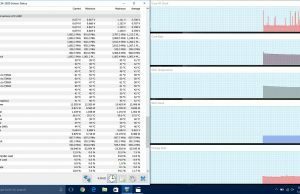 76.6W (~ 1 h 14 m of use) – gaming, Witcher 3 4k High – 30 Fps limit. As you can see, battery life is decent for a gaming laptop, but not that great when you compare it to an Optimus enabled machine. 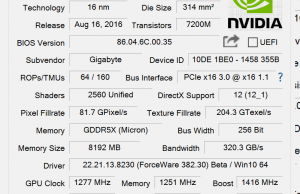 The 3k screen on the 1070 model might offer additional power savings, but I doubt it would be that significant. 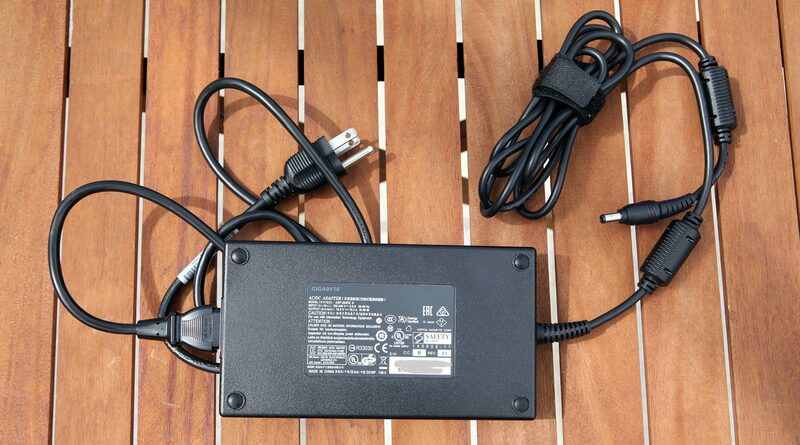 The included power adapter is only 200W, which is likely limiting the potential performance of this machine. The adapter’s dimensions are 6.7” x 3.8” x 1” and including the cords it weighs 1.8lbs. I’d like to think they were just trying to keep the power adapter small, but I can’t say this is the smallest 200W adapter I’ve ever seen. The adapter on the Asus Zephyrus for instance is smaller and 30W higher in wattage. Additionally, the Aorus x7 DT’s (review coming soon) adapter is 265W and has the same volume. The Aorus x5 MD is currently exclusive to Newegg for a steep price of $2899. But unless they knock $500 off the price tag or they fix their performance issues, I cannot in good conscience recommend this laptop to anyone. The fact is, you can purchase the lower priced model, which is exactly the same in every way except it performs better and only with a 1070. That model is also available at Newegg for $2550. For additional savings, there’s also a 3k model of the Aorus x5 v7, with only 16GB of Ram. 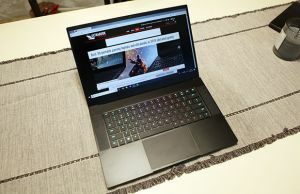 At the time of this review it’s $2399 and is available at places like Amazon (follow this link for mode details and updated prices at the time you’re reading the article). Putting the MD model aside, the prices for the Aorus x5 v7 model seem a little high, but are actually pretty reasonable considering what you’re getting. Sure you can get 15” laptops with a GTX 1070 in them for around $2000, such as the MSI GE62 or the Acer Predator 15. But considering the thinner form factor and the ability to have an overclockable CPU with a full GTX 1070 on this Aorus, $2399 might be a decent deal for many people. Do not waste your money on that x5 MD though. It’s not worth it, in my opinion, and there are better deals out there. If Max-Q is your thing, consider the Asus Zephyrus or even wait a little for the Acer Predator Triton to release. Or if you want to consider other GTX 1080 options, it looks like you’ll have to settle for a 17” model, else make some heavy sacrifices. Unless Aorus miraculously fixes things, which is still possible. But until then, I stand by my opinion. I think I’ve made it clear enough that I’m not a big fan of the Aorus x5 MD. I do, however, like the Aorus x5 model in general. It has it where it counts: nice build quality, good screen, good keyboard, lots of connectivity and upgrade options, etc. The trackpad is decent too, albeit very ugly. My main concerns with the model in general are the ugly logos and questionable Wifi reception. I’m also not a fan of that seam on the palm rest, but it’s not anything I can really ding them on considering I have no idea if it’ll be a problem in the future or not. So as a whole, if someone were to ask if the Aorus x5 v7(1070 version) was a good buy, I would have to say yes. I do not recommend the x5 MD model with Max-Q 1080, though. This is a perfect example of where not to use Max-Q and Aorus should not be rewarded more money for doing so. The fact is, you’re paying more money for less performance and it’s not worth it. I’ve heard the argument that the MD model might have quieter fans and that’s the benefit to that model. While that might be true (and I have yet to see anyone prove it’s quieter), I still don’t think it’s worth paying $350 extra for. In Aorus’ defense, this could all just be a mistake on their part, though, and there might be a fix for it coming in the future. It could be in the form of a larger power adapter or maybe a vbios fix. But until that happens, I caution anyone on considering the MD model. That’s about all I have to say about this one. I won’t have this model available for further questions, but I’ll be monitoring the forums to see if Aorus fixes any of the performance issues with the MD model(if that’s even possible). If you have any questions or comments about my findings, please feel free to leave a comment below. Really high quality review. I've long appreciated your detailed and insightful reviews. It's great that you give your true opinion and aren't one of those Youtubers who praise everything they review. Surprised and disappointed that 1080 MQ here performs worse than 1070. Are you sure it's a power supply issue? I'm disappointed that Aorus would overlook this and bring this machine to market with this performance downfall since premise of 1080 MQ is that it outperforms 1070. I would also be curious as to exactly how fan noise and thermals compare to the X5 v7 with 1070. From your review it sounds like both would be similar between the machines. I feel like Aorus should be given credit for building what is a fairly unique machine – thin and light but super powerful. 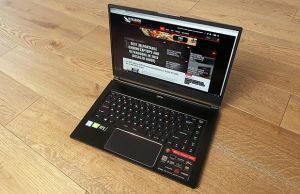 They have competitors like Razer and MSI but none of these laptops match eye for eye – all are somewhat different. It's a shame that Aorus can't get their build quality and optimization to an Apple-level of polish.. I'm not positive it's the power supply since I can't test that feature to prove it, but it's very likely that's the issue. 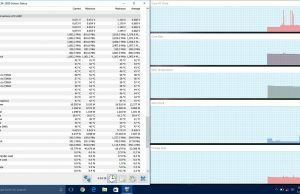 My HWinfo results are showing the power supply is maxed out and when I OC, I get erratic results. That usually means the CPU and GPU are fighting for power. Really, there's no reason this machine shouldn't perform equivalent to the Zephyrus. I'm also curious about the fan noise and would like to know what the real life difference is. I'm reviewing the x7 DT now though and can tell you that the ear level fan noise on that machine is 40dB when gaming. It's still not the x5 v7 but I'm only pointing it out because I was expecting the fans to be significantly louder. So I still think the noise levels might be similar. One thing to note is I have complete control of the fan curves on the x7 DT. It's probably the case with the x5 v7 as well, but I don't remember having this option on the x5 MD(I might have just overlooked it). When can we expect the X7 DT v7 review and also ca. 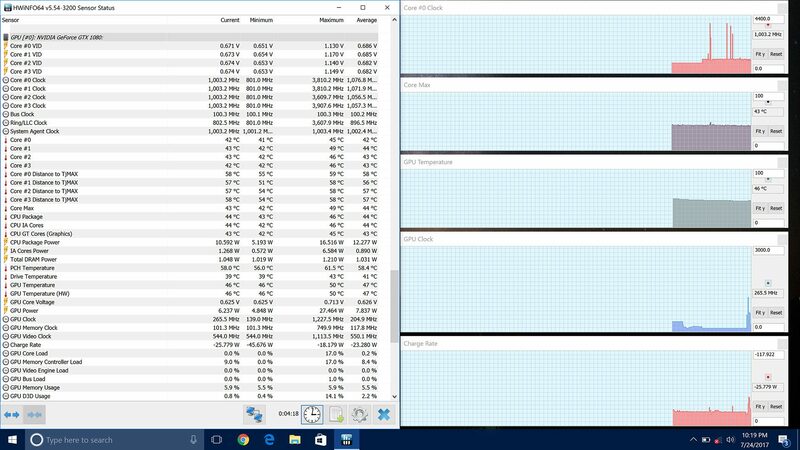 You conform on this comment fan noise while gaming on the X7 DT is only 40db, I was expecting it to be higher? I'm assuming you would recommend the X7 DT much more than the X5 MD? Also is the QHD screen better than UHD? I don't want to give it all away, but yes and yes. 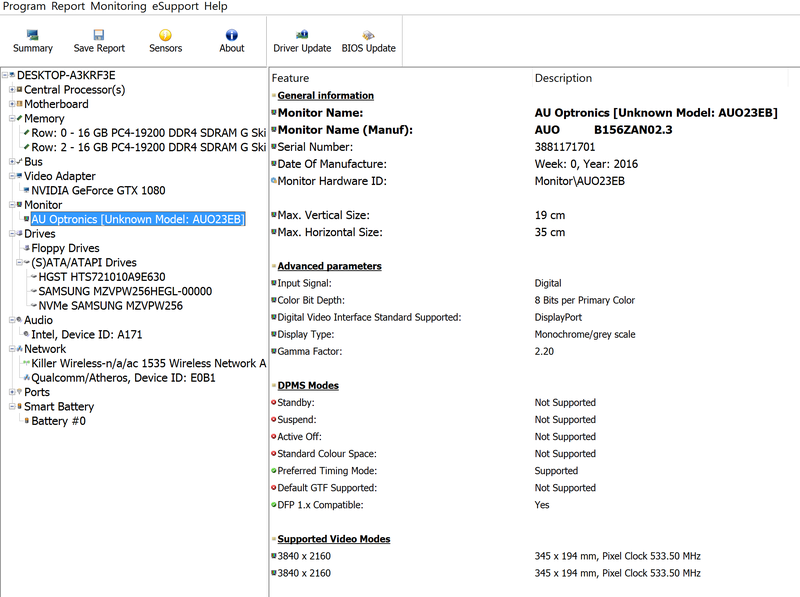 :) If the UHD screen on that model is B173ZAN though, you can't go wrong with either panel. Both panels have very good and different advantages to them, and it's all up to the user's personal preference. I'll explain it in more detain in my review though. 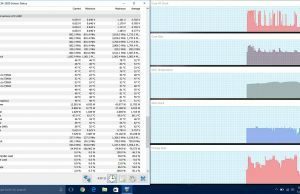 Have you had a chance to test/review the MSI Stealth Pro 1070 max-q and if so what did tob think? Better or worse than the X7 DT and Zephrus? I haven't, sorry. I don't think I'll be getting one either. My first thought is that $2500 is a bit much for a 1070. I'd love to know how it compares to a real 1070.
if you ignore the issue with the 1080 max q as well as the ugly logos on this laptop would you give it a 4 rating ? Other question: previous versions of this notebook were extremely loud under heavy gaming load. Do you see an improvement here (for both the md and v7 version) ? I mean 40db at ear level is slightly more than what my current Asus G750 produces and this laptop was famous for being very silent running a 780m. Back to the logo issue. I am wondering when OEM will realize, that most people spending 2500+ on a laptop do not want childish design. I am even wondering to give up on a 1070gtx and go 1060gtx as this seems to be the only way to avoid design from a 12-year-old. 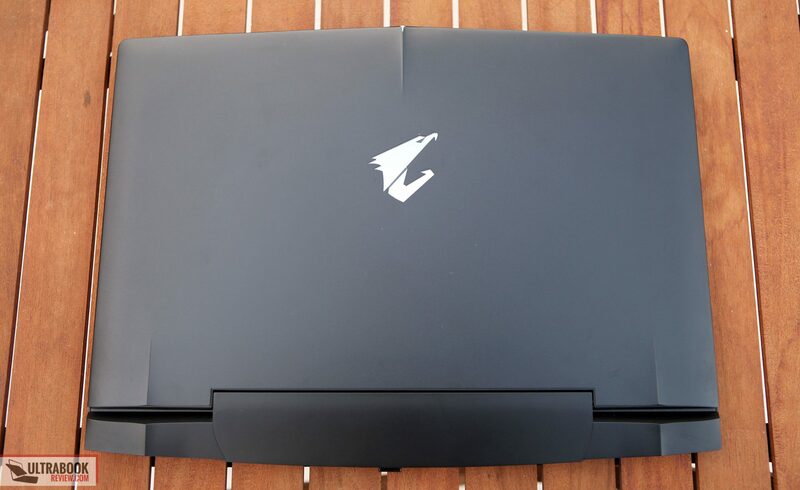 But I must say, that the logos on this laptop (at least on pictures) do not look as bad as "black&orange", "black&red", "rog" or even "predator" logos. I mean having the word predator on a laptop is an absolute no-go for me, no matter how good the machine is. Anyway, I would appreciate your thoughts on noise compared to previous versions. Easily a 3.75 and maybe a 4, yes. On paper, everything is the same except the GPU. Unfortunately I never had my hands on the v6, so I can't give you an apples to apples noise comparison. This is about on par with what I've been seeing with other gaming notebooks though. The v7 should be similar to the MD, but it might get louder if it's aloud to be overcloked more. This is the case with the X7 v7 DT, which I'm currently testing. I don't care if they manage to pack 10x the performance of GTX 1080. No way in hell am I spending US$3K on a laptop that doesn't last 2 hours on portable use. Maybe invest in developing better MUX technology, or drop G-Sync altogether and enable Nvidia Optimus graphics switching with a BIOS switch. Either that, or put a bigger battery on it. They also need to give us more options, even if it means higher or lower prices. 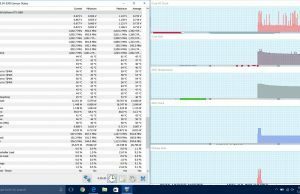 Cheaper base models with no built in memory, storage, and OS. High quality, lower resolution displays until the Windows scaling and battery life issues are resolved. This UHD panel is a good example of a pointless pixel density when brightness, contrast ratio and color saturation are all garbage. And for god's sake, what's up with the flimsy build and crappy touchpad, webcam, microphone and speakers? 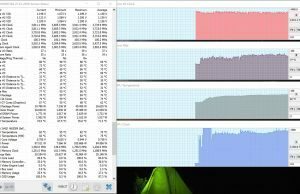 There's a reason why people buy Macbook, Razer Blade and business Mobile Worstations, despite their underpowered performance or a ridiculous price. Please don't let me down Gigabyte. 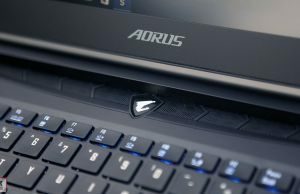 I have just ordered an Aorus x5 md please could you let me know which laptop has the quieter less annoying fans under load while playing a game the Asus Rog Zephyrus or the Aorus x5 md. No question, the Zephyrus. But you can adjust the fans in the Aorus. Hey! Im buying one of these on ebay, and it seems they really need 230 watt over the included 200 watt adapter. Is there a 230 watt charger i could use from current, or previous aorus models? Like plug and play? Or is the firmware limited at 200 watts? Some reviews have shown up to 240 watts draw under extreme loads. And it seems a 230 watt could improve overclocking! I'm honestly not sure if the firmware will allow a larger PSU or not. I've been keeping up with the forums and I don't remember hearing about anyone who has tried. Can't hurt to try – just make sure the voltage are the same. Sorry, wish I could help more.